Strangeness is afoot. I guess life can be like that. 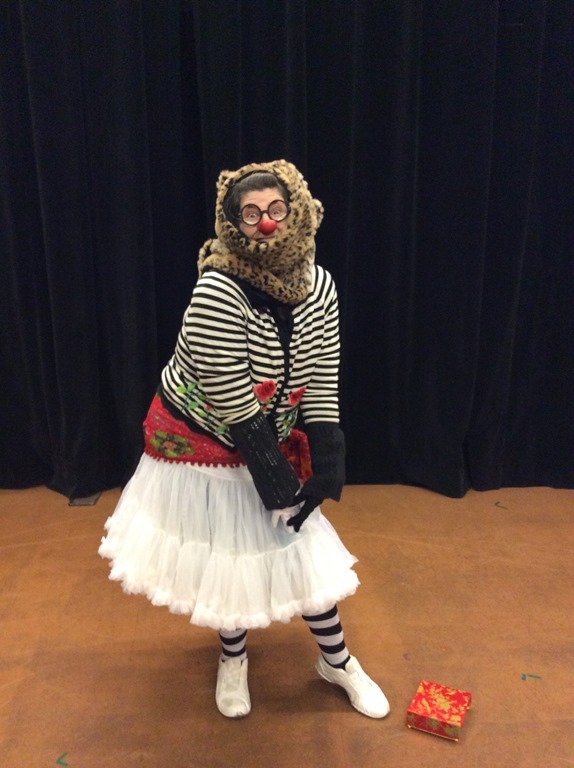 I took a four-day Intro to Clown Workshop with the simply divine teacher, Jan Henderson, a few weeks ago. 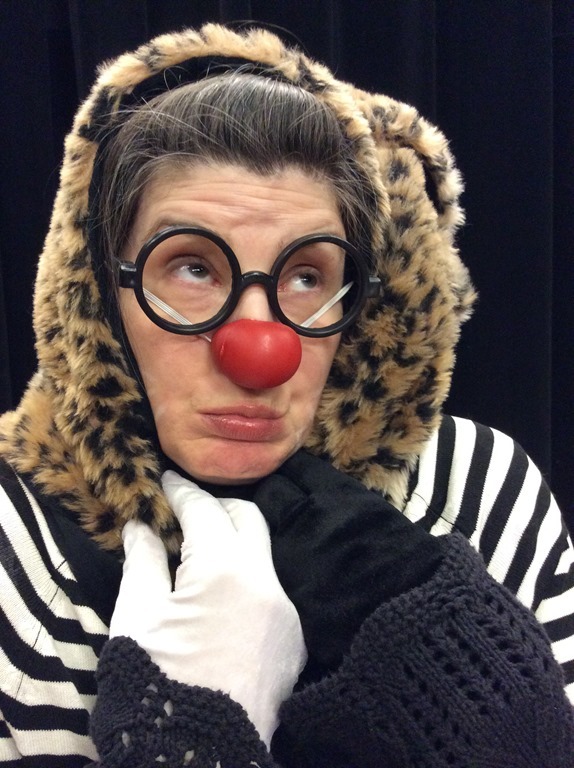 I had a few pre-conceived ideas about what my clown would be like, and a few things I thought I’d explore in my clown character, but – here’s the thing about clowning – you can’t know in advance how your personal clown will appear! Mine – surprise! – showed up as a cat! What a marvellous adventure I had in that class! There’s an element of serendipity in the birth of a new clown, and when you’re really listening carefully to your own gentle, innocent, intuitive voice within, clown miracles happen! Such a fantastic, luminous magnificence in every clown that was born that weekend. We were all very clearly defined in entirely unanticipated, but entirely perfect, ways. Everyone was adorable – including ME! I never thought of myself as “cute” before – but, it was true, as my cat-clown-character, I WAS SOOOOO CUTE!! Well, since then, the ‘cat’s been out of the bag’… (sorry! )… and my life has taken some surprising turns. I’ve been putting a lot of focus on exploring my new cat-clown. Her name is Zephyr (defined as: a gentle westerly wind) and, beyond any explanation my rational mind can make for it, ‘she’ does seem to have a ‘will’ of her own. I can come up with ideas for her, but once the nose goes on, I can’t anticipate her actions or make her do something she doesn’t want to. I feel like I’ve just begun to know this marvellous, crazy little kitty and it’s thrilling – to my bones – to discover her! I’m passionate about her! In fact, I LOVE her!! And I want her to LIVE!! Like I said, it makes no sense to my rational mind. A CLOWN??? That’s what I want to DO??? NO!! REALLY??? But… yes. I can’t help it. I don’t even know what it means, or what it looks like, but yes. YES. Wholeheartedly – YES!!! Somewhere inside of me, it’s what I’ve ALWAYS wanted! Apparently, my mind is much stronger than I think, and my desire… was fulfilled. Shucks, ultimately, I didn’t even have to DO anything – I’d already succeeded! A litany of minuscule mistakes were cited – nothing that amounted to more than a hill of beans, in my humble opinion – but, surprise! I got my wish! I was hurt, yes, but, at the same time, I couldn’t get out of there faster. I’m FREEEEEEEEE!!!!! The relief I feel is astounding. I was making such great efforts to conform to expectations – when I never truly knew what any of the expectations were. Now I see that conforming is not for me. It never was. It never will be. How that looks in this world of ‘jobs’ and ‘paycheques’ and ‘bosses’ – I have no idea. How I go forward from here… I don’t know. What I’m most interested in now is something along the lines of ‘embracing my CRAZY’. Letting all the crazy things I gotta say just come out of my mouth with no judgement, and doing all the crazy things I never had the guts to do before. When I think of all the times people laughed at something I did on stage, I was always doing something physical – clown gags! In all my attempts to be the ‘serious’ drama girl, the ‘Shakespeare’ girl, the ‘spiritual’ girl – I was always simply denying the delightful life of my inner FOOL! In all my attempts to reject and project ‘crazy’ onto the outside screen – my inner crazy was there all the time, inviting me to give in to its GENIUS. Let’s face it, folks, this is the truth: we’re all just bumbling idiots in this game of life. Most of us think we’ve got it all figured out: we follow all the rules because we desperately want to be those ‘good’ little girls and boys we imagine; we project our ‘mistakes’ onto others because we can’t face our own ‘terrible’ imperfections; and we pretend we have the authority to make others bend to our will and do things we most prefer them to. And we’re shattered when somebody shows up that we can’t manipulate. HA! This is what I’ve learned: If I let others be free to do whatever they do, without judgement, it’s a gift I give to MYSELF! And the ‘authority’ I fear is just as much of a bumbling idiot as everyone else; scrambling around for tiny morsels of acceptance and inclusion – but always terrified that they’re not worthy of it. They’re not any better than me, or wiser. They don’t know something more than I do. Because, kids, none of us know ANYTHING!!! The ONLY authority is ME – MY choice over MY life in this moment, NOW. And not knowing, in any way, how it’ll turn out – but hopeful that, if I do what I most want now, the outcome will be something along the lines of what I want (consciously or unconsciously, at least) later. That’s it. And now I think I know what Thomas Edison felt like; his mind filled with a flood of creative fire that couldn’t be quenched. I’ve been so creatively energized lately – with creations of all varieties spilling out of me at record pace. No wonder I didn’t want to go to work – what I’m doing at home is so much more, infinitely, fulfilling. Here’s something else I’ve learned recently: you can’t get rid of desires by sublimating them. That’s not what The Buddha did to become enlightened. I tried denying my desires for ten years – and it only hurt me. At the same time, I also know the danger of desires running rampant – they’re a bottomless bucket. So what else did The Buddha say… ummm… something about the MIDDLE way? Haha. Yes. That’s what I’m shooting for now. Some desires just have to be lived through. Lived though? What FOR? … for joy and happiness. That’s right, kids. FOR JOY and HAPPINESS. Whose joy and happiness? MINE. Does it sound selfish? It does – but that’s because I can’t live by what someone else wants – even if I know exactly what that is. We’ll never succeed at that game – because everyone’s responsible for their OWN happiness. We can’t choose it for someone else – but we CAN choose it for ourselves, right now. And that’s exceptionally good news! Peace and love, holy brothers and sisters – darling crazy fools – every last one of ya!